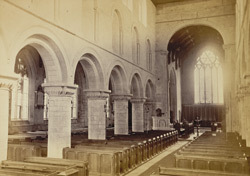 Interior view of Sutton Saint Mary Church in Lincolnshire. In 'The Fen and Marshland Churches' the Vicar of Mansfield H Leigh Bennett describes the church as, "a large and beautiful specimen of varied pointed architecture, with considerable dignity of mass, depth of shadow, and bold projection. You enter...You find yourself in a noble Norman nave. On round or polygonal piers ranges of circular arches bear on either side a Norman clere-story...the presence of those massive columns and their plain round-headed arches makes the nave like that of a little Cathedral."